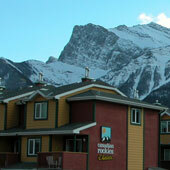 Canmore is becoming a desireable place here in the Canadian Rockies. Europeans have discovered its charm and Asians love the atmosphere. This little community is following in Banff's footsteps and becoming a hot spot for tourists, but often tourists with the outdoors in mind. Hiking, biking, cross-country skiing, skating - it is all at your doorstep. Afterwards relax in one of our cozy restaurants or take a stroll through a gallery. Time to hit the hay? Come check out which hotel is right for your type of stay. Grizzly Bear Room with 1 Queen Bed. Four Bear Room with 2 Queen Beds. Kodiak Suites with custom hand made pine log furniture and king size bed. Honey Bear Suite (king deluxe room) with custom hand made pine log furniture, fireplace, jacuzzi tub, TV with DVD, king size log bed and a balcony. Family Bear Suite with 2 queen beds, one double sofa bed, some with fireplace. Cooking Bear Suite with kitchen facility, one queen bed, one double sofa bed. Amenities include: Air Conditioning, cable TV and breakfast. Enjoy the large riverstone fireplace in the lobby. Meeting facilities also available. During some seasons, a minimum stay is required. Check website for specials. Canadian Rockies Chalets is located right in Bow Valley Trail, not far from downtown and features 39 two and three bedroom suites. The Bear Den offers 2 bedrooms, the Railroad Retreat offers 3 bedrooms and the Cougar Chalet offers guests 3 bedrooms. Amenities include TV, DVD player, dining area, full kitchens, hair dryer, complimentary coffee, cleaning service (upon request, $20 extra charge per clean). Railroad Retreats are equipped with gas fireplaces and 1 or 2.5 baths, depending on layout). 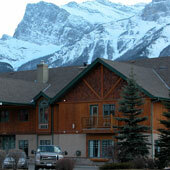 Accommodation amenities include outdoor hot tub, on-site gas BBQs, complimentary parking, DVD rentals, conference area. Falcon Crest Lodge features elegant rooms and suites with gas fireplace, kitchens or kitchenettes, and luxurious room amenities including a private deck with gas barbeque, washer and dryer (1 and 2 bdr suites only), 27" TV with DVD player, cable TV. Weekly rates are available and include daily removal of garbage and fresh towels, with full clean every 4th day of stay. Hotel amenities include two outdoor hot-tubs with panoramic views, workout room, heated underground parking which is secured to guest access only. Visit Tennesee Jacks Rotisserie Chicken and Ribs Restaurant with licensed lounge. Banquet room with veranda also available. Condo amenities include gas fireplace, TV (in living room and each bedroom), DVD player, stereo with CD player, patios on lower levels/balcony’s on upper levels, external storage lock-up, washer & dryer. Kitchen is fully-equipped with dishes, cutlery and cooking utensils. Resort amenities include an outdoor hot tub (open year-round), exercise room (with change rooms), covered parking, executive board room and meeting facilities, AVEDA amenities, high speed Internet access. Main Level: kitchen, dining area, living room, guest bathroom and deck. Upper Level: bedrooms, full bathroom(s) and patio/balcony access. 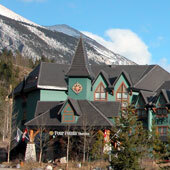 The Four Points Sheraton in Canmore is located at the turn off to SilverTip nad has a real mountain flair to it. Hotel amenities include complimentary fitness facilities, outdoor hot tub, complimentary High Speed Wireless Internet access. Take advantage of the complimentary business centre, free ski and golf club storage as well as same day dry cleaning services. Dine on site at Renzo's Ristorante and Lounge which serves their guests with fresh Canadian and International cuisine.